Welcome to another Epi-Sold of Wine Down Wednesday with Janis (and Ripley). If you tuned in to the last Wine Down Wednesday, it shouldn’t be a surprise that the beverage of choice this week is H2O with lemons due to dry January and a challenge by a friend to drink more water. Tonight I decided to chat about first time home buyers. I can remember how excited Ed and I were when we bought our first home year ago, and I learned a lot about what I should and shouldn’t do through that process. Make sure you get pre-approved, see where your credit is at and decide what you feel comfortable paying every single month before you even start looking. Just because you qualify for a certain price point, doesn’t mean it’s actually realistic for you. Keep in mind things like car payments, if you’re going to be getting married or have kids and the type of lifestyle you see for yourself throughout the next 30 years. When you know what the budget is for you, your realtor can better help you find houses you love in your price range and help you avoid a lot of disappointments. 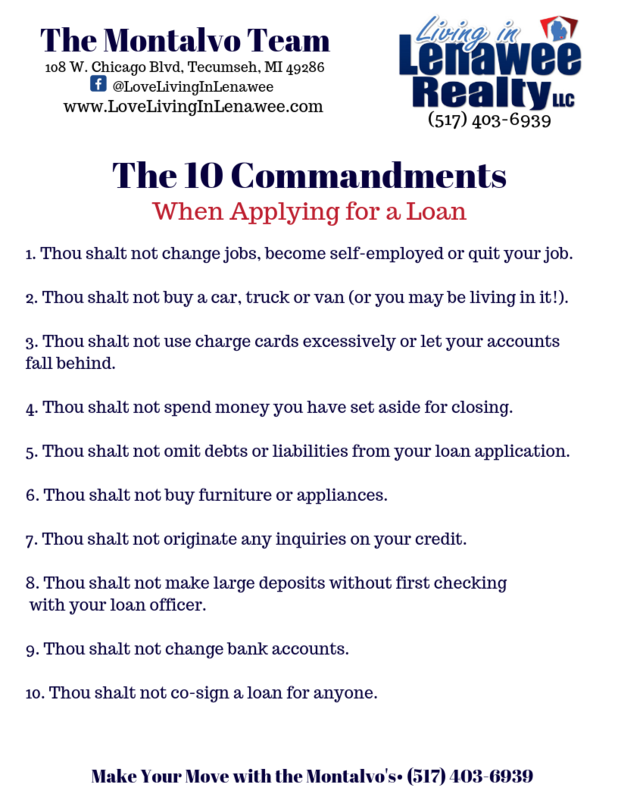 Follow the 10 commandments below if you’re even thinking about buying in the near future to know what lenders are on the look out for and to lower your financial risk so you get pre-approved and make the loan process go smooth! Find this list at the bottom of this blog. Everyone has must-have’s (Garage, outbuildings, number of bathrooms) but when you are thinking realistically in your budget, they might fall into your wish list instead. Hiring an experienced realtor, they can tell you how realistic they are for your budget, but make sure you share this list with them. Be reasonable with what you can afford. Your first home may not be your dream home, but when you budget future improvements, it certainly could be. I believe that your first house should really be your investment house. For Ed and I, our first home allowed us the ability to buy property and build our dream house. Keep an open mind. When you’re working with a realtor, it’s really good to talk out loud with your buyer’s agent because that’s how they really find out what you like and don’t like. Communication is key to finding your home. Make sure you are working with an experienced realtor. Most people know someone in real estate, and maybe it’s a family friend, but that might not always be the best choice. When it comes to making the largest person in your life, pick someone who is experienced. An experienced agent will have connections. They can walk you through the mortgage process, they can look at your good faith estimate and tell you if everything looks okay, they can help you with inspections and give you accurate timelines (buying insurance, give notice if you’re in a lease to avoid expensive pitfalls). Experienced realtors spend a good amount of time negotiating on their client’s behalf to represent your interests. Make sure you are using someone who is qualified, experienced, knows the ropes and will negotiate on your behalf. You can’t afford not to do a home inspection. You may think that saving the money for your down payment seems economical, but not in the long run. Pay for a good home inspector, not just a contractor. A home inspector does not care if you buy the home or not, they just want you to know what you are buying. You can learn so much about your future home by doing an inspection. You can attend the inspection and ask questions, give you advice on maintenance or things that will need to be done right away that you may need to budget for. Your real estate agent should be doing a market analysis on what your buying and give you direction on what you should offer. Also, they should be able to walk you through what is reasonable in what your offering. I always say, “If it’s meant to happen, it will happen”. Sometimes there’s multiple offers on a house or someone out bid you, so if you lose that house more than likely that’s just a perfect opportunity to find a house that suites you better. Stay up to date with local events and more episodes of Wine Down Wednesday and Saturday Spotlight!